Sixty-five men were baptized at the ministry Sunday, November 11, 2018. Men and women from all over came out to show their support for the men who decided to outwardly express the change they’ve experienced within. They displayed how Jesus Christ has been working in their lives. The men couldn’t have chosen a better day to publicly show their dedication to the King of Kings and Lord of Lords. The temperature had dropped a week prior but that wasn’t going to hold any of us back. After service we gathered around the pond with our friends and family looking on, to witness an amazing spectacle. 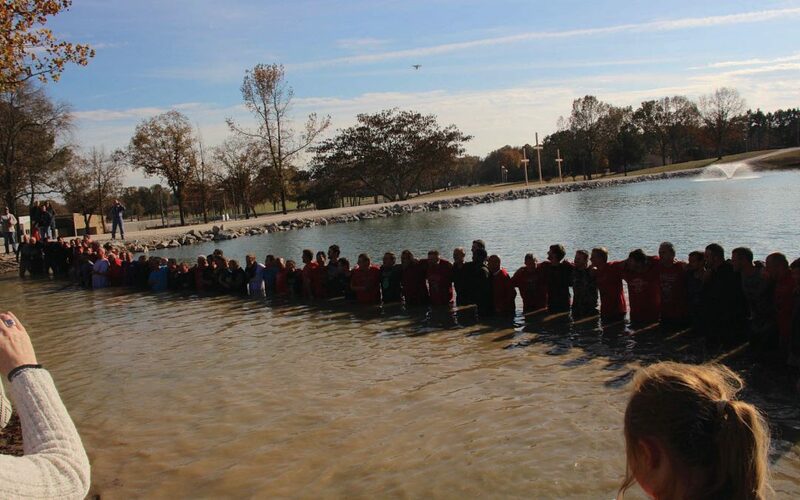 The residents all lined up near the water’s edge and told the crowd why they wanted to get baptized. After the last man passed the microphone, the instructors got into the water. Then fourteen residents at a time waded into the pond waste deep and stood beside an instructor. They baptized them in the name of the Father, the Son, and the Holy Spirit. The crowd rejoiced as the old man was immersed and the new man arose.